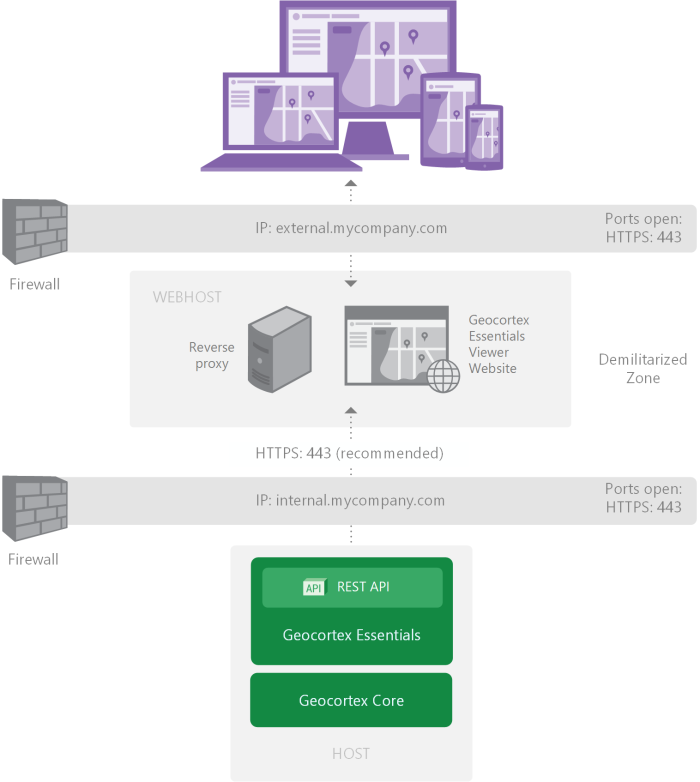 A typical Geocortex Essentials deployment consists of at least one server that runs Essentials and Geocortex Core. Geocortex Core provides software services that Geocortex applications like Essentials use. This deployment case is suitable for most Essentials installations can be installed and updated out of the box. Alternatively, a custom Geocortex Essentials deployment consists of two or more clustered servers. A cluster is a group of servers that function as a single system. The end user's experience is the same regardless of which server in the cluster the user connects to. You cannot change the name of the server after installing and running Geocortex Essentials. 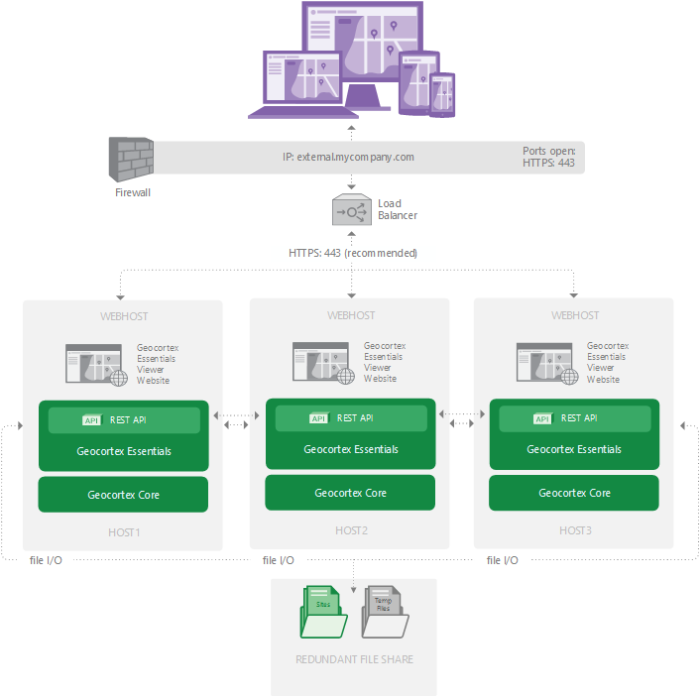 In addition to the Multi-Server Deployments section below, see Geocortex Core and Clustering if you intend to deploy your Geocortex products to multiple servers. A single-server deployment consists of a single Essentials server that handles all of the requests from client web applications. This means that Geocortex Core, Geocortex Essentials, and a client viewer application all run from the same machine. This deployment method is available out of the box and is recommended for most implementations. You can install Essentials and run the Post Installer to set up a fully functional single-server environment. We recommend you avoid installing Essentials on the same server as ArcGIS Enterprise. Essentials supports multi-server environments. You can deploy Essentials instances to multiple servers and cluster the instances of Geocortex Core that are required to run Essentials. However, Essentials is not engineered to automatically upgrade clustered deployments. Additional steps may be required to upgrade Core, Essentials, and its viewers. The following sections outline possible multi-server deployment patterns. However, depending on the complexity of your environment, how you choose to manage security, your Geocortex Core data, and distributed file systems might vary. If you need help with a multi-server deployment, contact Geocortex Support. Essentials versions 4.4 through 4.5 can be clustered alongside the latest version of Essentials by using the Geocortex Essentials Legacy Version Compatibility Tool which is available from the Essentials Downloads area on the Geocortex Support Center. This tool ensures that your legacy Essentials instances are compatible with Geocortex Core. If you need to retain legacy versions of Essentials, see Geocortex Core Backwards Compatibility with Essentials 4.4 and 4.5. Geocortex Essentials is not engineered to automatically upgrade load-balanced deployments. Manual steps may be required to upgrade Essentials in a load-balanced, multi-server environment. If you need help upgrading a multi-server deployment, contact Geocortex Support. The time required to complete the upgrade depends on the complexity of your environment. Please ensure that you have adequate Support hours available. In a multi-server cluster, each server provides redundancy and load balancing. This means that if the first server fails, the second and third server ensure that users can still access your site. The three servers share a single copy of Essentials' configuration, and each server has a copy of Geocortex Core's live data. You can set up a redundant fileshare between the servers for the Sites and Temp folders, which provides redundancy for configuration files, resource files, and any temporary files. Most Essentials functionality is available from a web browser. Configuring Essentials as a two-tiered model introduces increased management overhead. Since an Essentials viewers run client-side in the browser, scaling up the web tier is usually not necessary to handle additional load. Additionally, manual steps may be required to upgrade Essentials and viewer templates in a multi-server environment. If you need help upgrading a multi-server deployment, contact Geocortex Support. The time required to complete the upgrade depends on the complexity of your environment. Please ensure that you have adequate Support hours available. If your organization requires an additional layer of security between the client and server, you can configure Essentials to use a two-tier architecture. In this configuration, a server hosts the client-side Essentials viewers and another server hosts the Geocortex Essentials application. A public zone with an external IP address (external.mycompany.com) for your configured viewers. The client can access this zone. A private zone with an internal IP address (internal.mycompany.com) for the Essentials server. Administrators and developers can access this zone. Use a reverse proxy to ensure that there is another address between what end users see and your server. 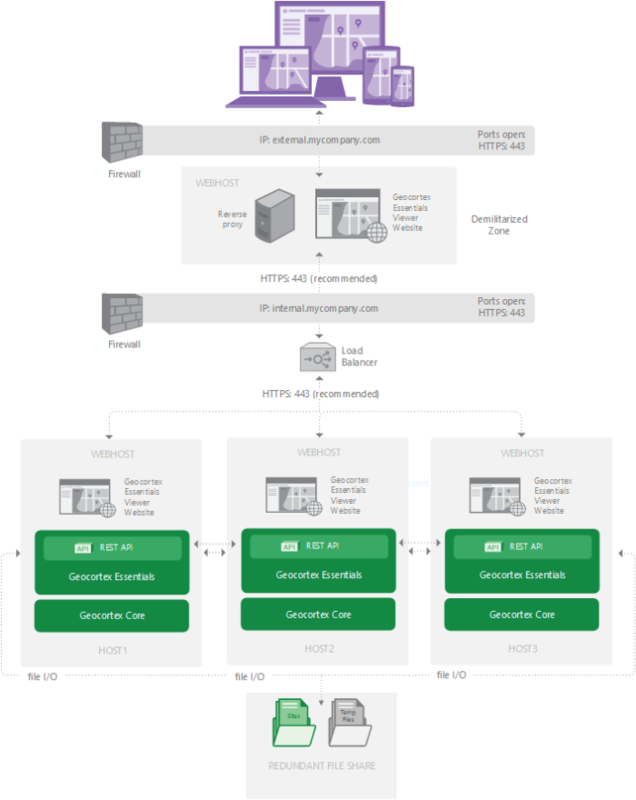 For more information about reverse proxies, see Run Essentials Behind a Reverse Proxy. Additional security is provided by the use of the secure socket layer (SSL) protocol, HTTPS. If your organization requires redundancy and additional layers of security, you can deploy Essentials to two or more servers and cluster each server's instance of Core. We strongly recommend clustering at least three instances of Core, which greatly reduces the risk of a "split-brain" scenarios when two instances of Core lose connectivity. See Loss of Connectivity in a Two-Server Cluster (Split-Brain Scenario) for more information. Alternatively, you may be a Geocortex Analytics customer who wishes to use a multi-server deployment environment. In this configuration, the servers share a single copy of the configuration stored on a redundant fileshare. The following diagram show a multi-server clustered deployment with a two-tier application architecture.